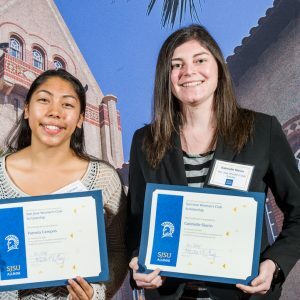 Continuing its historic support of San Jose State University, San Jose Woman’s Club provides annual academic and vocal scholarships to promising undergraduates at San Jose State University. 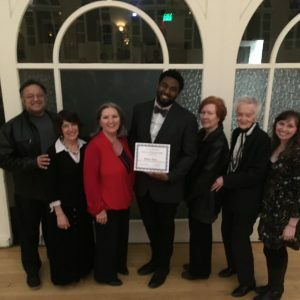 San Jose Woman’s Club Vocal Scholarships are awarded each spring by a panel of judges following a live competition by promising San Jose State University students. Congratulations to Malcom Jones, who was awarded SJWC's 2016-2017 Vocal Scholarship on April 10. Seven San Jose State University vocal scholars competed before a panel of judges and a live audience for the scholarship. Following performances that dazzled the audience with the quality and talent of the students, guests met the performers over cookies and coffee while the judges deliberated. Mr. Jones will perform in concert this fall at the Clubhouse. A Health Science major, Darian has been involved in the Peer Health Education program at SJSU which has helped him develop public speaking skills and expanded on knowledge of serious issues in the community. Darian believes that the relevance of the community work supplements his coursework resulting in a deeper passion for education. Darian is also involved in the Health Science Honor Society, making connections with peers who wish to enter the same career field. To reconnect with her roots, Pamela is currently in her second semester of a study abroad program in Mexico. Pamela’s professional goal includes encouraging the California Department of Education to create policies that endorse nutritive living, ambitious students, and the elimination of the achievement gap. Her passion lies in helping all children reach their maximum potential and creating a more humanitarian society. As a court appointed special advocate for a child, Gabrielle has developed a deep connection with youth and is majoring in Child and Adolescent Development. Her career goal is to eventually become an elementary school teacher or a social worker so that she can make a difference in the lives of those with whom she works. Growing up partially deaf, Gabrielle feels her disability has made her stronger and confident in her abilities to complete tasks and assignments. Read more about these and previous academic scholars. As a court appointed special advocate for a child, Gabrielle has developed a deep connection with youth and is majoring in Child and Adolescent Development. Her career goal is to eventually become an elementary school teacher or a social worker so that she can make a difference in the lives of those with whom she works. Growing up partially deaf, Gabrielle feels her disability has made her stronger and confident in her abilities to complete tasks and assignments. For more information see the video.